Fort Morgan [Baldwin Co, AL] BROADCAST MEDIA reports RIP CURRENTS at 25 Mar, 2:00 PM CDT -- *** 1 FATAL, 5 INJ *** ONE PRESUMED FATALITY. A 17 YEAR OLD MALE FROM WISCONSIN WAS PULLED UNDER BY A RIP CURRENT OFF A FORT MORGAN BEACH SUNDAY AFTERNOON AND HAS NOT YET BEEN FOUND. FIVE OTHER SWIMMERS WERE RESCUED ON SUNDAY ALONG FORT MORGAN AND TAKEN TO AREA HOSPITALS FOR TREATMENT. hail. A WW will probably be needed soon. along a quasi-stationary rain reinforced boundary over southeast TX. A TORNADO WATCH has been issued for parts of Western and Central Louisiana, Southeast Texas and East Texas until 9:00 PM. 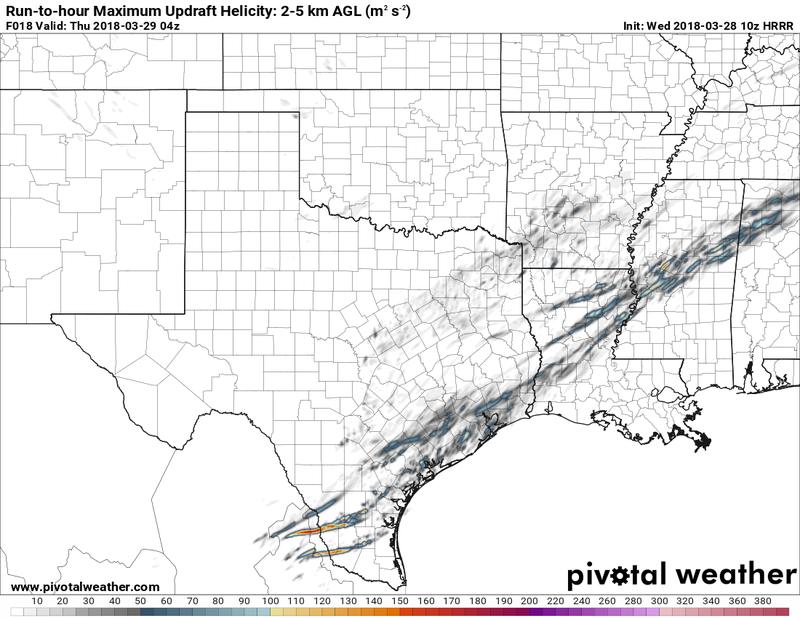 The SPC notes conditions are favorable for damaging gusts, isolated large hail, and the potential for multiple tornadoes beginning this afternoon. Day 2 slight risk extended to cover SELA. should diminish by evening, as the airmass stabilizes diurnally. Up near alexandria, radar was showing some string winds. Radar indicated upwards of 80MPH!!! miles northeast of Natchitoches, moving east at 40 mph. was located 12 miles northwest of Winnfield, moving east at 45 mph. was located near Winnfield, moving east at 55 mph. Monroe and Brownsville-Bawcom around 440 PM CDT. Claiborne and West Monroe around 450 PM CDT. Cheniere, Caderville, Lapine and Folksville. * Until 545 PM CDT. was located over Greater Greenspoint, moving east at 30 mph. Northwestern Bush Intercontinental Airport around 540 PM CDT. The severe weather threat for Tornado Watch 22 continues. parts of southwest and central LA. Texas Coast into parts of southwest and central LA. Segno, Moss Hill, Romayor and Rye.